A systematic review of results achieved by lifestyle-modification programs based on BT-OB concluded that after 1 year of treatment, about 30% of participants had reached a weight loss of ≥10%, 25% between 5% and 9.9%, and 40% of ≤4.9%.7 Such weight reduction is known to be associated with a reduced incidence of type 2 diabetes, as well as medical weight-related comorbidities and weight-related psychosocial issues, and produces an overall improvement in quality of life.8 However, BT-OB-related weight loss reaches its peak after 6 months, and about half of patients return to their original weight within about 5 years.9 This indicates that BT-OB fails to reach the ultimate goal of long-term weight-loss maintenance in a large subgroup of patients. Furthermore, although today’s weight-loss lifestyle-modification programs based on BT-OB have introduced some generic procedures derived from cognitive therapy4 (eg, problem-solving and cognitive restructuring techniques) and social cognitive theory3 (eg, goal-setting, modeling, and self-efficacy) for tackling obstacles to losing weight, their main focus is still on changing eating habits rather than producing cognitive change.19 Moreover, even in its modern incarnation, the treatment is poorly individualized, being administered to groups according to a prescribed order of sessions and failing to take into account each patient’s progress. Some preliminary data show that adding cognitive procedures to weight-loss lifestyle modification is associated with better maintenance of weight loss20 and less weight regain.21 Moreover, a recent randomized controlled trial found that participants allocated to a BT-OB intervention featuring integrated cognitive procedures, derived from acceptance and commitment therapy, dialectical behavior therapy, and relapse prevention for substance abuse, achieved significantly greater weight loss at 12 months than those assigned to standard BT-OB.22 Although this finding contrasts with results from a controlled clinical trial that failed to find a positive effect of CBT-OB proposed by Cooper et al on long-term weight loss maintenance,23 it is possible that this conclusion was at least in part determined by the time-limited duration of the treatment in question. As noted by the authors themselves,23 it is also possible that the treatment was insufficiently effective in changing the cognitive processes thought to be involved in weight regain, despite this being the main aim. It is also possible that it failed to target other key cognitive processes responsible for weight regain. In addition to these shortcomings of BT-OB, emerging data on the important role of cognitive factors and procedures in influencing obesity-treatment outcomes and the apparent need of patients with severe obesity for more intensive treatment suggest that innovative programs designed to manage obesity more effectively are overdue. In light of this need, we describe here a new, more individualized approach to obesity treatment called multistep CBT-OB. This approach largely follows the traditional procedures of BT-OB and CBT-OB, but integrates several specific procedures. These are designed to address some cognitive processes that our previous research has found to be associated with attrition, weight loss, and weight maintenance.15,16,24–26 The main goals of our program are thus to help patients to change their eating and physical activity habits and to develop a cognitive change that promotes both weight loss and weight loss maintenance. The treatment is delivered within a stepped-care approach that can be applied, with appropriate adaptation, at three levels of care (outpatient, day hospital, and residential). It can be used to treat all classes of obesity, and we also welcome patients with severe comorbidities and disability associated with obesity, who are not usually included in BT-OB trials. The treatment that we are currently evaluating may be delivered at three levels of care, as part of a stepped-care approach. Patients usually start the treatment with outpatient CBT-OB (step 1), unless they have serious medical comorbidities and/or disability. In this case they may be channeled directly to day hospital (step 2) or residential CBT-OB (step 3), as appropriate to their individual case. The most distinctive and unique characteristic of multistep CBT-OB is that whatever program step or steps that the patients undergo, they are treated according to the same theory and procedures. The only difference among the various steps is the intensity of treatment, with less unwell patients being treated using outpatient CBT-OB and more severely affected sufferers being given the treatment in a day hospital or residential setting. Outpatient CBT-OB may be delivered individually or in group sessions, and is led by a single therapist. It includes two phases (Figure 1): phase 1, which has the aim of helping patients to achieve a healthy weight loss (eg, a weight loss of at least 10%) and to be satisfied with this weight; and phase 2, which has the aim of helping patients to develop a lifestyle and mind-set conducive to long-term weight maintenance. Phase 1 is preceded by a preparatory phase, and usually lasts about 24 weeks. It is delivered in 16 sessions, the first eight being held once a week and the remainder every 2 weeks. Phase 2, on the other hand, lasts 48 weeks and is delivered in 12 sessions that are held at 4-week intervals. The six modules that comprise the treatment are delivered across phase 1 and phase 2, and are introduced in a flexible and individualized way, according to the patient’s needs. Generally speaking, however, module 1 is introduced in the first session, module 2 and 3 in the second session, module 4 in the third session, and module 5 is begun two to three sessions before the start of phase 2, in which module 6 is commenced. Each module introduces specific strategies and procedures that may be adapted to patients’ individual progress and barriers. Sessions are cumulative, meaning that the third session, for example, includes the topics, strategies, and procedures introduced in modules 1–4. Each session lasts 50 minutes, and is divided into four parts, each with a distinct objective: 1) in-session weighing, 2) reviewing monitoring records and homework, 3) setting and working through the agenda, and 4) summing up the session, confirming the homework assignments, and arranging the next appointment. Since practical difficulties, such as time constraints, are associated with attrition from real-world treatments for obesity,34 sessions should preferably be scheduled at times compatible with a patient’s workday and other activities. Figure 1 General organization of cognitive behavioral therapy for obesity (CBT-OB). The day-hospital and residential CBT-OB steps both last 21 days, and are delivered by a multidisciplinary team composed of physicians, dieticians, psychologists, physiotherapists, and nurses, all trained in CBT-OB. Each patient is given an individualized rehabilitation program that includes the following principal procedures: 1) a low-calorie diet based on the Mediterranean diet; 2) a motor/functional rehabilitation program designed to improve the function of muscles that have become hypotonic and/or hypotrophic due to disuse, and to restore range of motion and improve cardiocirculatory and respiratory capacities;18 and 3) a daily group CBT-OB session in which patients are actively trained to use the procedures of modules 1–3 of outpatient CBT-OB (Figure 1). The only difference between the day-hospital CBT-OB and residential CBT-OB is that in the former patients sleep outside the unit. Once patients have completed this intensive phase, they are advised to continue their CBT-OB treatment in the outpatient setting. Since such patients have already implemented the procedures of modules 1–3 during the intensive CBT-OB phase, postintensive outpatient treatment does not include these, which would otherwise be delivered during the first two sessions of outpatient CBT-OB. In our institution, outpatient CBT-OB patients would be charged €35 for each group session and €65 for each individual session, while day-hospital treatment and residential CBT-OB are priced at €125 and €205 per day, respectively. However, as it recognizes the potential economic benefits associated with tackling obesity,35 the local regional branch of the Italian National Health Service entirely covers the cost of day-hospital and residential treatment, whereas those only eligible for outpatient treatment are asked to contribute €30 per session. The preparatory phase of CBT-OB has the aim of assessing the nature and the severity of a patient’s obesity, as well as any associated medical and psychosocial comorbidities. In this phase, patients are assigned to the appropriate level of care (step) by means of their CASCO-R scores. Another fundamental goal of the preparatory phase is to engage patients in the treatment. Multistep CBT-OB does not generally involve a long period of preparatory motivational work to engage patients in the treatment, because the treatment itself is inherently motivating. Indeed, patients readily engage once they feel that they are being understood and have a good chance of achieving early change. In order to promote engagement, however, patients are asked to provide their personal reasons and motives for losing weight, any previous history of weight loss attempts, and their attitude toward physical activity. They are also asked for details of their support networks (partners, family, friends, and coworkers) and anything that may comprise a barrier to change.2 As part of the engagement process, patients are also educated about obesity and the benefits of weight loss, as well as the objectives, duration, organization, procedures, and potential outcomes of the treatment. An integral part of the preparation phase is informing patients about the attitude they should adopt during the course of their treatment. Specifically, we tell them that they should consider the treatment a priority, an opportunity for them to make a fresh start and build a new life no longer conditioned by the problems associated with obesity and its complications. We also tell patients that it is crucial to “start well”, because the amount of weight loss achieved in the first 4–8 weeks is the major predictor of weight loss in the long term.36 Similarly, we emphasize the importance of continuity during the treatment in order to establish a fundamental therapeutic “momentum’’. To replace automatic and dysfunctional eating and physical activity habits with new healthy habits and a new way of thinking about weight control, it is vital for patient and therapist to be able to work together as a team seamlessly from session to session. Therefore, patients are advised not to take breaks, and an appropriate substitute is provided should their therapist need to be absent. As in other forms of CBT,30 patients are educated on the importance of completing specific homework tasks, and patients’ undertaking to do so is sought as a priority. Self-monitoring of food intake, physical activity, and body weight is the core procedure of BT-OB,37 and an adapted version is also central to multistep CBT-OB, because the greater the use of self-monitoring, the larger the amount of weight lost.37 However, the monitoring record used in multistep CBT-OB (Figure 2) differs from a traditional food diary in that it is used both to record mealtimes and the food, drink, and calories that the patient is planning to consume in advance (the first three columns), and then to record in “real time” (ie, in the precise moment at which the food is consumed), whether or not the meal plan is adhered to. 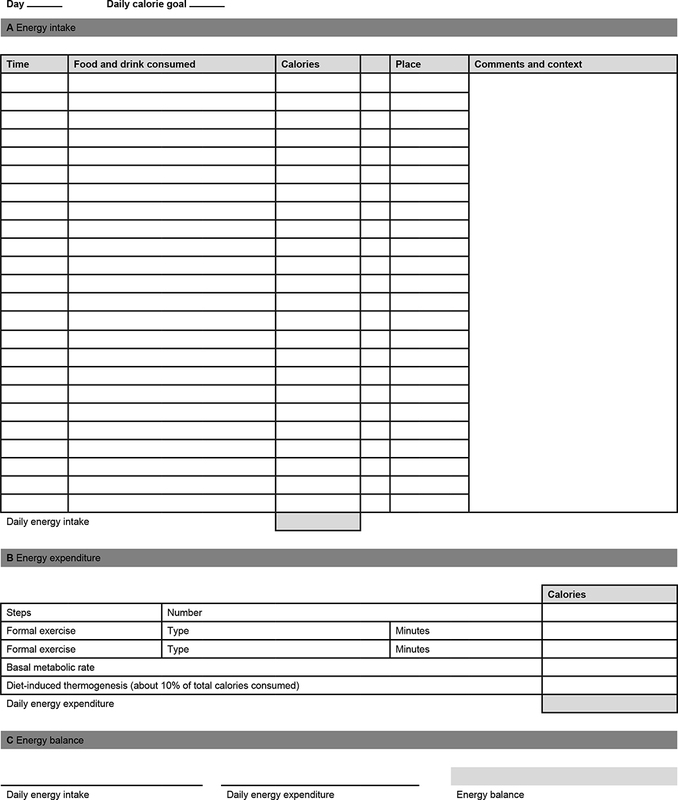 Patients are asked to note any such changes in their monitoring record, and to recalculate their calorie intake accordingly. 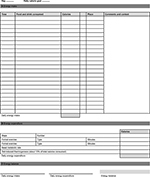 The monitoring record is also used by the patient to note where the food or drink is consumed, and to place asterisks in the fourth column adjacent to any episodes of eating or drinking that they felt were excessive; they are invited to use the last column to record any events and/or feelings that have influenced their eating. Figure 2 Monitoring record used in multistep cognitive behavioral therapy for obesity. By providing patients with a detailed picture of their eating habits, advance meal planning and real-time monitoring of eating bring to their attention their obstacles to weight loss. Moreover, it makes patients more aware of what they are doing while they are eating, which helps them to eat in a mindful way and interrupt dysfunctional and automatic eating habits that had previously seemed uncontrollable. This way of eating should continue until new habits conducive to weight control have become automatic. As patients seeking to lose weight tend to underestimate their calorie intake by almost 50%,38 alongside monitoring module 1 also provides patients with several practical strategies to improve their ability to estimate their food intake. They are encouraged to use known-capacity measuring tools, such as cups, spoons, and food scales, and taught how to read nutritional information labels. Practical in-session exercises are dedicated to these activities, and patients are given a handbook listing the calorie content of foodstuffs. Likewise, patients are trained in dedicated sessions to calculate a rough estimate of their energy expenditure by adding their basal metabolic rate (measured by indirect calorimetry or estimated by means of the Harris–Benedict formula)39 to their diet-induced thermogenesis (estimated as 10% of the total amount of energy ingested over 24 hours),40 the calories burned through lifestyle activities (the daily steps, measured using a pedometer) and formal exercise (using the metabolic equivalent of task). At the end of each day, patients thereby calculate a rough estimate of their daily energy balance by subtracting the daily energy expenditure from the daily energy intake. Digital technology can be exploited to help patients monitor their food intake and physical activity (devices and/or apps that calculate calorie intake and expenditure) during phase 1 with a view to addressing obstacles and behaviors in real time. Suspension of self-monitoring is however encouraged in phase 2. Nevertheless, patients are encouraged to record their weight once a week throughout the treatment, because the regular checking of weight is associated with better long-term weight maintenance.41 Weighing is carried out in sessions in the first 8 weeks (or in the unit during intensive CBT-OB) and then at home. As in CBT-E for eating disorders,30 the patient’s weight is plotted on an individualized weight graph, prepared in advance, and then the patients are actively involved in interpreting changes in their weight. They are encouraged to focus on the past 4 weeks, rather than the latest single reading, to avoid misinterpretation. They are also informed that their weight may be affected by variations in their hydration status, and that unexpected gains should thus not undermine their continued attempt to lose weight. The dietary recommendations used in multistep CBT-OB are designed to produce an energy deficit of 500–750 kcal a day. This is expected to yield weight loss of around 0.5–1 kg per week.8 The program educates patients to follow an eating plan based on the Italian Mediterranean diet. Although the Mediterranean diet produces no demonstrably greater weight loss than diets with other macronutrient compositions,42 we chose to apply it for its well-known health benefits, and because it is preferred by the population we treat.43 However, as suggested by the American Heart Association/American College of Cardiology/Obesity Society guideline for the management of overweight and obesity in adults,8 the dietary approach may be adapted to the patients’ individual preferences, metabolic targets, and health status. The QUOVADIS study, which investigated quality of life in 1,944 treatment-seeking patients with obesity in a “real-world” setting,44 found that weight loss is associated with an increase in cognitive dietary restraint and a reduction in cognitive dietary disinhibition.16 For this reason, multistep CBT-OB involves several specific procedures designed to help patients to improve their adherence to the dietary plan, at the same time increasing dietary restraint and reducing dietary disinhibition. First, since it has been found that adherence to diet may be enhanced by increasing diet structure and limiting food choices, thereby reducing temptation and potential mistakes in energy-intake calculation,5 multistep CBT-OB patients are provided with structured meal plans.45 These serve both to provide a structural framework to the diet – and in doing so improve adherence – and indirectly to increase dietary restraint and reduce dietary disinhibition. As part of the program, patients are also provided with grocery lists, menus, and recipes based on the prescribed diet. Another feature of multistep CBT-OB is that with the consent of patients, their significant others (ie, partner or parental figures) are involved in their treatment through joint sessions. This process is initiated in module 2, and aims to create the optimal environment for change. When the patients begin phase 2, they are helped to adjust their dietary plan to be able to maintain the weight lost. This module of multistep CBT-OB is aimed at gradually helping patients to achieve a level of physical activity sufficient to determine an energy expenditure of 400 kcal per day. This is expected to facilitate weight loss, maintain muscle mass, and prevent weight cycling.46 Unlike diet, exercise adherence tends to increase the less structure is imposed, presumably through a reduction in the barriers to exercising (eg, lack of time or financial resources).5 Therefore, the exercise recommended as part of multistep CBT-OB is primarily increased lifestyle activities, ie, increasing the level of physical activity involved in daily activities. As such, patients are furnished with a pedometer and encouraged to check their baseline number of steps. They are then recommended to add 500 steps per day at 3-day intervals until they reach the target of 10,000–12,000 steps/day. Patients may choose to replace walking with jogging (20–40 minutes/day), cycling, or swimming (45–60 minutes/day). Based on their performance in baseline physical fitness tests, patients are instructed to execute specific calisthenic exercises twice a week. These are selected to improve specific components of physical fitness, such as upper- and lower-body strength, flexibility, and balance. This module is designed to help patients identify and address their individual obstacles to weight loss. 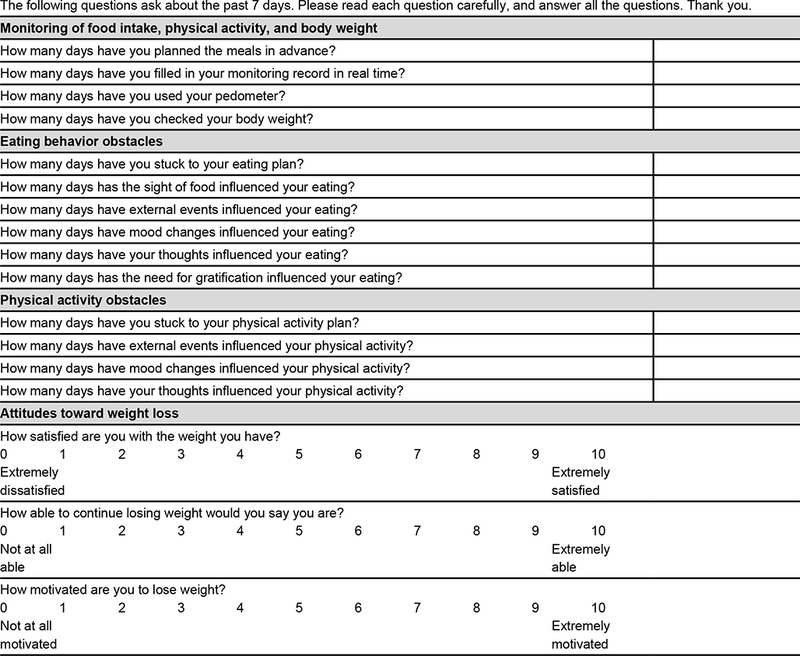 The patients are actively involved in identifying these obstacles through a collaborative review of their monitoring records, and weekly compilation of the weight loss obstacles questionnaire (Figure 3). Figure 3 Weight loss obstacles questionnaire. With the help of the therapist, the obstacles identified are included by the patients in their cognitive behavioral formulation: this procedural tool has been specifically adapted to individualize multistep CBT-OB. The formulation concept is widely used in other areas of cognitive behavioral therapy,30 but not generally in BT-OB or CBT-OB. It involves creating a visual representation (a diagram) of the cognitive behavioral processes that hinder adhesion to the lifestyle changes needed to lose weight (Figure 4),2 specifically: 1) antecedent stimuli, which are divided into eating (ie, presence of excessive quantity of food in the environment, social occasions) and non-eating stimuli (eg, events, changes in mood, impulses to eat, places, time of day); 2) positive consequences (eg, gratification or elimination of aversive states through food); and 3) problematic thoughts (ie, thoughts that hinder adherence to the lifestyle changes needed to lose weight). Figure 4 Diagram used by patients and therapist to build their personalized cognitive behavioral formulation of weight-loss obstacles. Once the formulation has been created, the therapist discusses its implications with the patient. They emphasize that control of eating is not wholly dependent on their willpower, but can be improved by learning specific cognitive and behavioral skills designed to counteract the biological, environmental, cognitive, and emotional pressures to eat to excess and adopt a sedentary lifestyle. The therapist should also underline that the formulation is provisional and will be custom-modified as needed during the treatment. Indeed, the personalized formulation enables the treatment to be fully individualized by implementing only the strategies and procedures that are potentially useful for addressing the obstacles to change acting within that patient (Table 1). Data from the QUOVADIS trial and observational studies indicate that higher weight loss expectations seem to be correlated with attrition.15,24,25 However, another report has suggested that encouraging participants to seek only modest weight loss at the beginning of treatment produces lower overall weight loss than standard BT-OB.47 Furthermore, a recent study has shown that higher weight loss targets seem to promote greater weight loss, and that both weight-loss satisfaction and weight loss are associated with better maintenance of the weight lost.15 Therefore, to avoid compromising initial weight loss, multistep CBT-OB does not attempt to tackle unrealistic expectations at the beginning of treatment. Instead, it seeks to encourage patients to pursue and be satisfied with achievable short-term weight-loss goals (eg, a weight loss of 0.5–1 kg per week). Unrealistic goals are addressed later on, over the course of phase 1. At this point, patients will have had some success in reaching intermediate goals, and a trusting and collaborative relationship will have been established with their therapist. In module 5, which is likely to coincide with a decline in the rate of weight lost, the cognitive strategies and procedures described by Cooper et al19 are introduced to help patients accept and feel satisfied with a reasonable weight and healthy weight loss. Other strategies are also used at this point to help patients to address primary goals that are not always achievable with weight loss (eg, improving interpersonal relationships and/or self-confidence, finding a partner, changing jobs). Module 6 coincides with the beginning of phase 2 of the program. Patients now attend one session every 4 weeks over 48 weeks. During this time, patients are encouraged to interrupt any attempt to lose more weight, and instead to focus actively only on the long-term maintenance of the weight they have already lost.19 As such, the main goal of module 6 is to help patients develop the cognitive and behavioral skills necessary to maintain the weight lost in the long-term. As part of this process, patients are educated that weight loss maintenance is hindered by a complex interaction of environmental, biological, behavioral, and cognitive factors.48 They are also warned that weight regain is common among those who lose weight. However, patients are informed that the results of some studies (eg, the National Weight Control Registry) have shown that maintenance of the weight lost is possible, but requires the long-term adoption of the following strategies:49 high levels of physical activity (about 1 hour per day), eating a low-calorie, low-fat diet, eating breakfast regularly, self-monitoring weight frequently, and maintaining a consistent eating pattern across weekdays and weekends. To help them adopt these complex behaviors, patients are educated that it is necessary for them to develop a long-term weight-control mind-set. They should also be taught to identify and act upon early signs of relapse (ie, changes in eating and physical activity habits) and to implement a preestablished plan immediately when their body weight goes beyond the weight-maintenance binary of 2 kg. Toward the end of this phase, patients are instructed in self-efficacy. They are reassured that they have all the tools they need to be able to maintain their lower weight by themselves, and told that it is now time to apply the procedures learned throughout treatment without the therapist’s supervision. They are encouraged to suspend use of their monitoring records, and in their place are helped to build a written weight-maintenance plan. This should include both the behavioral and cognitive procedures designed to maintain their weight, as well as those that will help them deal with any potential setbacks. They are also invited to attend posttreatment review sessions at 20 and 40 weeks after the end of treatment. These sessions are focused on discussing their progress and any obstacles they have met while attempting to maintain weight, and adjusting their weight-maintenance plan as appropriate. The efficacy of residential CBT-OB has been assessed in 88 patients with severe obesity, allocated either a high-protein diet (HPD) or a high-carbohydrate diet (HCD), in a randomized control trial. The treatment studied in this trial included 3 weeks of residential CBT-OB followed by outpatient CBT-OB.50 The attrition rate observed in the HPD (25.6%) and in HCD (17.8%) groups was similar to that reported in controlled trials of behavioral treatment,51 but much lower than the 50% attrition rate commonly observed in the community after standard weight loss treatments.24 Among completers (n=69), weight loss at 43 weeks was 15% for HPD and 13.3% for HCD, and no significant difference between the two arms was observed throughout the study period. Both diets also produced a similar improvement in cardiovascular risk factors and psychological profiles. The percentage weight loss achieved by these treatments was much higher than the mean 8%–10% seen in conventional lifestyle-modification programs based on BT-OB; furthermore, no tendency to regain weight was observed between 6 and 12 months. A combination of factors is likely to have influenced these positive outcomes. In particular, the initial residential period undoubtedly promoted adherence to lifestyle changes, as patients were not exposed to additional food stimuli and were led in gradual daily physical activity rehabilitation by a CBT-OB physiotherapist. Long-term adherence after discharge was also likely promoted by the deconditioning of patients from their food- and non-food-related eating stimuli achieved during the 3 weeks of inpatient treatment. In fact, a recent study to compare the long-term effects of residential CBT-OB in 54 patients with severe obesity with or without binge-eating disorder (BED)52 found that after 5 years of follow-up, 51.5% patients no longer met the diagnostic criteria for BED. There was no difference in mean weight loss between the two groups of patients (6.3 kg in BED vs 7.4 kg in non-BED, P=0.755), and it is also interesting to note that patients in this study received no outpatient CBT-OB after discharge. Multistep CBT-OB was developed on the basis of these encouraging results, and is currently being assessed in two ongoing observational outpatient studies (one that delivers the treatment individually and one in group sessions) conducted in a real-world clinical setting. Multistep CBT-OB is a new treatment that can be delivered at three levels of care (outpatient, day hospital, and residential) in empirical and logical steps designed to minimize cost and intrusiveness and maximize outcomes. The treatment seeks to address some of the main flaws in BT-OB that could limit its long-term efficacy in treating obesity, ie, the lack of individualization, and the prevalent focus on the behaviors implicated in weight loss and maintenance at the expense of cognitive processes influencing long-term adherence to lifestyle modification. Multistep CBT-OB also uses specific procedures and strategies designed to address some relevant cognitive processes that have been overlooked by previous versions of CBT-OB. Moreover, it is suitable for treating patients with severe obesity and associated medical comorbidities and disability, who are generally referred for bariatric surgery rather than attempting less invasive approaches. If the promising findings thus far reported for residential CBT-OB are confirmed in the long term and by ongoing studies on outpatient CBT-OB, multistep CBT-OB has the potential to provide a more efficacious alternative to traditional weight-loss lifestyle modification for patients with obesity. Stuart RB. Behavioral control of overeating. Obes Res. 1996;4:411–417. Dalle Grave R, Calugi S, El Ghoch M. Lifestyle modification in the management of obesity: achievements and challenges. Eat Weight Disord. 2013;18:339–349. Bandura A. Social Foundations of Thought and Action: A Social Cognitive Theory. Englewood Cliffs, NJ:Prentice-Hall; 1986. Beck AT, Rush AJ, Shaw BF, Emery G. Cognitive Therapy of Depression: A Treatment Manual. New York: Guilford Press; 1979. Fabricatore AN. Behavior therapy and cognitive-behavioral therapy of obesity: is there a difference? J Am Diet Assoc. 2007;107:92–99. Wadden TA, Butryn ML, Wilson C. Lifestyle modification for the management of obesity. Gastroenterology. 2007;132:2226–2238. Christian JG, Tsai AG, Bessesen DH. Interpreting weight losses from lifestyle modification trials: using categorical data. Int J Obes (Lond). 2010;34:207–209. Wadden TA, Sternberg JA, Letizia KA, Stunkard AJ, Foster GD. Treatment of obesity by very low calorie diet, behavior therapy, and their combination: a five-year perspective. Int J Obes. 1989;13:39–46. Keesey RE, Hirvonen MD. Body weight set-points: determination and adjustment. J Nutr. 1997;127:1875S–1883S. French SA, Story M, Jeffery RW. Environmental influences on eating and physical activity. Annu Rev Public Health. 2001;22:309–335. Look Ahead Research Group. Eight-year weight losses with an intensive lifestyle intervention: the Look Ahead study. Obesity (Silver Spring). 2014;22:5–13. McGuire MT, Wing RR, Klem ML, Hill JO. Behavioral strategies of individuals who have maintained long-term weight losses. Obes Res. 1999;7:334–341. Jansen A, Houben K, Roefs A. A cognitive profile of obesity and its translation into new interventions. Front Psychol. 2015;6:1807. Calugi S, Marchesini G, El Ghoch M, Gavasso I, Dalle Grave R. The influence of weight-loss expectations on weight loss and of weight-loss satisfaction on weight maintenance in severe obesity. J Acad Nutr Diet. 2017;117:32–38. Dalle Grave R, Calugi S, Marchesini G. The influence of cognitive factors in the treatment of obesity: lessons from the QUOVADIS study. Behav Res Ther. 2014;63:157–161. Donini LM, Dalle Grave R, Di Flaviano E, et al. Assessing the appropriateness of the level of care for morbidly obese subjects: validation of the CASCO-R scale. Ann Ig. 2014;26:195–204. Capodaglio P, Donini LM, Petroni ML, et al. Rehabilitation in obesity with comorbidities: a consensus document from experts of the Italian Society of Physical and Rehabilitation Medicine (SIMFER), the Italian Society of Obesity (SIO) and the Italian Society of Eating Disorders (SISDCA). Eat Weight Disord. 2014;19:383–386. Cooper Z, Fairburn CG, Hawker DM. Cognitive-Behavioral Treatment of Obesity: A Clinician’s Guide. New York: Guilford Press; 2003. Stahre L, Tärnell B, Håkanson CE, Hällström T. A randomized controlled trial of two weight-reducing short-term group treatment programs for obesity with an 18-month follow-up. Int J Behav Med. 2007;14:48–55. Werrij MQ, Jansen A, Mulkens S, Elgersma HJ, Ament AJ, Hospers HJ. Adding cognitive therapy to dietetic treatment is associated with less relapse in obesity. J Psychosom Res. 2009;67:315–324. Forman EM, Butryn ML, Manasse SM, et al. Acceptance-based versus standard behavioral treatment for obesity: results from the Mind Your Health randomized controlled trial. Obesity (Silver Spring). 2016;24:2050–2056. Cooper Z, Doll HA, Hawker DM, et al. Testing a new cognitive behavioural treatment for obesity: a randomized controlled trial with three-year follow-up. Behav Res Ther. 2010;48:706–713. Dalle Grave R, Calugi S, Compare A, et al. Weight loss expectations and attrition in treatment-seeking obese women. Obes Facts. 2015;8:311–318. Dalle Grave R, Calugi S, Molinari E, et al. Weight loss expectations in obese patients and treatment attrition: an observational multicenter study. Obes Res. 2005;13:1961–1969. Dalle Grave R, Melchionda N, Calugi S, et al. Continuous care in the treatment of obesity: an observational multicentre study. J Intern Med. 2005;258:265–273. Wadden TA, West DS, Delahanty L, et al. The Look Ahead study: a description of the lifestyle intervention and the evidence supporting it. Obesity (Silver Spring). 2006;14:737–752. Diabetes Prevention Program Research Group. The Diabetes Prevention Program (DPP): description of lifestyle intervention. Diabetes Care. 2002;25:2165–2171. Brownell KD. The Learn Program for Weight Management. Dallas, TX American Health Publishing; 2000. Dalle Grave R. Multistep Cognitive Behavioral Therapy for Eating Disorders: Theory, Practice, and Clinical Cases. Plymouth, UK: Jason Aronson; 2013. Linehan MM. Cognitive Behavioral Treatment of Borderline Personality Disorder. New York: Guilford Press; 1993. Marlatt GA, George WH. Relapse prevention: introduction and overview of the model. Br J Addict. 1984;79:261–273. Grossi E, Dalle Grave R, Mannucci E, et al. Complexity of attrition in the treatment of obesity: clues from a structured telephone interview. Int J Obes. 2006;30:1132–1137. Espeland MA, Glick HA, Bertoni A, et al. Impact of an intensive lifestyle intervention on use and cost of medical services among overweight and obese adults with type 2 diabetes: the action for health in diabetes. Diabetes Care. 2014;37:2548–2556. Unick JL, Neiberg RH, Hogan PE, et al. Weight change in the first 2 months of a lifestyle intervention predicts weight changes 8 years later. Obesity (Silver Spring). 2015;23:1353–1356. Burke LE, Wang J, Sevick MA. Self-monitoring in weight loss: a systematic review of the literature. J Am Diet Assoc. 2011;111:92–102. Lichtman SW, Pisarska K, Berman ER, et al. Discrepancy between self-reported and actual caloric intake and exercise in obese subjects. N Engl J Med. 1992;327:1893–1898. Harris JA, Benedict FG. A biometric study of human basal metabolism. Proc Natl Acad Sci U S A. 1918;4:370–373. O’Neil PM, Brown JD. Weighing the evidence: benefits of regular weight monitoring for weight control. J Nutr Educ Behav. 2005;37:3 19–322. Mancini JG, Filion KB, Atallah R, Eisenberg MJ. Systematic review of the Mediterranean diet for long-term weight loss. Am J Med. 2016;129:407–415.e4. Gotsis E, Anagnostis P, Mariolis A, Vlachou A, Katsiki N, Karagiannis A. Health benefits of the Mediterranean diet: an update of research over the last 5 years. Angiology. 2015;66:304–318. Melchionda N, Marchesini G, Apolone G, Cuzzolaro M, Mannucci E, Grossi E. The QUOVADIS study: features of obese Italian patients seeking treatment at specialist centers. Diabetes Nutr Metab. 2003;16:115–124. Wing RR, Jeffery RW, Burton LR, Thorson C, Nissinoff KS, Baxter JE. Food provision vs structured meal plans in the behavioral treatment of obesity. Int J Obes Relat Metab Disord. 1996;20:56–62. Dalle Grave R, Calugi S, El Ghoch M. Increasing adherence to diet and exercise through cognitive behavioural strategies. In: Lenzi A, Migliaccio S, Donini LM, editors. Multidisciplinary Approach to Obesity. Heidelberg: Springer; 2015:327–335. Foster GD, Phelan S, Wadden TA, Gill D, Ermold J, Didie E. Promoting more modest weight losses: a pilot study. Obes Res. 2004;12:1271–1277. Wing RR, Phelan S. Long-term weight loss maintenance. Am J Clin Nutr. 2005;82:222S–225S. Dalle Grave R, Calugi S, Gavasso I, El Ghoch M, Marchesini G. A randomized trial of energy-restricted high-protein versus high-carbohydrate, low-fat diet in morbid obesity. Obesity (Silver Spring). 2013;21:1774–1781. Wing RR. Behavioral approaches to the treatment of obesity. In: Bray GA, Bouchard C, James PT, editors. Handbook of Obesity: Etiology and Pathophysiology. New York: Marcel Dekker; 1988:855–873. Calugi S, Ruocco A, El Ghoch M, et al. Residential cognitive-behavioral weight-loss intervention for obesity with and without binge-eating disorder: a prospective case-control study with five-year follow-up. Int J Eat Disord. 2016;49:723–730.